Gov. Chris Christie said Tuesday he has personally apologized to a southern New Jersey official whom he called a "crazy mayor." Christie made the remark about North Wildwood Mayor Patrick Rosenello during a town-hall style campaign gathering in New Hampshire on Monday. It was in response to the Republican mayor's statement that flooding in his Cape May County town was worse than during Superstorm Sandy. Speaking at a news conference Tuesday, Christie said Rosenello is "a longtime friend." The Republican presidential candidate said he got carried away at a town hall, noting that it's not the first time that has happened. "I had a night to sleep on it and I didn't feel good about what I said, so I called him to apologize," Christie said. "It merited an apology and I gave him one." NBC10’s Cydney Long is in Trenton where she asked Governor Christie about the “mop comment” he made regarding coastal flooding in South Jersey over the weekend. She has the latest. Christie has said the flooding that occurred in New Jersey was not as bad as it could have been, saying Cape May was the only county where it happened. Some other counties in the southern part of the state had minor or moderate flooding. When the Republican presidential candidate was asked Monday why he was campaigning in New Hampshire instead of staying in New Jersey, Christie reiterated his statements and said he had heard "one crazy mayor down in South Jersey say this is worse flooding than Sandy." Christie then said that North Wildwood did not get hit by the October 2012 storm, which caused catastrophic damage along the coast and in other areas of the state. "So of course it's worse than Sandy for him!" Christie said. "Well, damn, man. You didn't get any flooding in Sandy! So if you got a foot of flooding — it would be worse than Sandy." 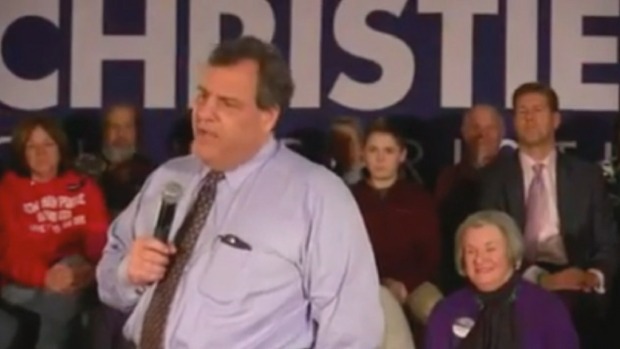 When the questioner persisted, Christie said: "I don't know exactly what you expect me to do. You want me to go down to Cape May with a mop?" Rosenello, who said he was "disappointed" to hear about Christie's remarks, confirmed with NBC10's Ted Greenberg that Christie later called to apologize. Flooded Shore Towns Tell Christie to Put His Mop "Where the Sun Don't Shine"
Governor Chris Christie made a comment while in New Hampshire downplaying the storm damage and coastal flooding in his home state of New Jersey. That caused a stir in many people facing the aftermath of the Blizzard of 2016. NBC10’s Ted Greenberg is in West Wildwood where people are not too happy about the Governor’s commentary. He said he accepted the "genuine" apology but the governor should also reach out to other people he offended. "The governor very graciously did call me this morning. Again, I’ve known the governor for many years. He knows my wife and he knows my children. He apologized for the personal comments that he made about me. I accepted that apology. I think it was a genuine apology," Rosenello said. "I think that the lack of compassion for our residents and business owners — I expressed that to him — that is still a concern and the lack of respect that was shown for our first responders. So I would hope that he would take the time at some point in the near future to communicate that fact to them." Rosenello also disagreed with the notion that Sandy was a non-event in North Wildwood. "A lot of the same people who were flooded out this past weekend had significant damage during Hurricane Sandy," Rosenello said. Rosenello had said Monday that he was "disappointed that (Christie) would lower himself as much as he did," noting that he was one of his earliest supporters during both of his runs for governor. Rosenello also said he has met and interacted with Christie and his family numerous times. The mayor said his town's dune system had suffered major damage and was "severely compromised" by the weekend snowstorm. He also said that roughly 150 people were safely evacuated from their flooded homes during the weekend storm. "My perspective is somewhat different from that of the governor as he campaigns in New Hampshire," Rosenello said. Residents in North Wildwood and neighboring towns were still working Tuesday to clear water-logged carpets, appliances and other items they say were damaged by the flooding. West Wildwood resident Bob Steffney told The Press of Atlantic City that he saw flooding creep up to his front porch before it receded without getting into his home. "It was scary. You had piles floating down the street like it was a river," the 66-year-old Steffney said. "I don't have flood insurance. I'm retired. I can't afford it." State Sen. Jeff Van Drew, a Democrat who represents Cape May and Cumberland counties, asked the governor on Monday to seek a federal disaster declaration for those areas, citing the reported flood damage. Christie said the state is assessing the damage to see if it meets the required minimum to apply for such relief. 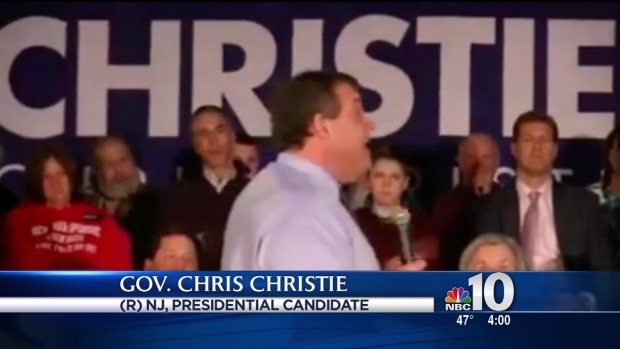 Christie further clarified his comments during an interview with NBC10's Cydney Long Tuesday. "What I was objecting to both on Sunday, Monday and I object to today is any type of characterization of what happened in Jonas to be anywhere near what happened in Sandy," Christie said. "It's not even close. It's not even in the same ballpark. Now, if your house is flooded, that doesn't matter to you. If your business is flooded that doesn't matter to you but I was not gonna allow there to be a conversation, which is mostly driven by the media, that somehow this was worse than Sandy."